Springs at Thermes, Xanthi Prefecture, Greece. English : Springs at Thermes, Xanthi Prefecture, Greece. Tunnel in Fort de Mutzig (Feste Kaiser Wilhelm II). The 19th century German fort in Alsace is located near Mutzig (today : France). This is a tone-mapped HDR. English : Tunnel in Fort de Mutzig (Feste Kaiser Wilhelm II). The 19th century German fort in Alsace is located near Mutzig (today : France). This is a tone-mapped HDR. The Soyuz TMA-17 spacecraft is seen as it lands with Expedition 23 Commander Oleg Kotov and Flight Engineers T.J. Creamer and Soichi Noguchi near the town of Jezkazgan, Kazakhstan on Wednesday, June 2, 2010. NASA Astronaut Creamer, Russian Cosmonaut Kotov and Japanese Astronaut Noguchi are returning from six months on-board the International Space Station where they served as members of the Expedition 22 and 23 crews. English : The Soyuz TMA-17 spacecraft is seen as it lands with Expedition 23 Commander Oleg Kotov and Flight Engineers T.J. Creamer and Soichi Noguchi near the town of Jezkazgan, Kazakhstan on Wednesday, June 2, 2010. NASA Astronaut Creamer, Russian Cosmonaut Kotov and Japanese Astronaut Noguchi are returning from six months on-board the International Space Station where they served as members of the Expedition 22 and 23 crews. Ceiling of the Maccabees Chapel in Saint-Pierre cathedral, Geneva, Switzerland. English : Ceiling of the Maccabees Chapel in Saint-Pierre cathedral, Geneva, Switzerland. Women in a tribal (Gond adivasi) village, Umaria district, India. English : Women in a tribal (Gond adivasi) village, Umaria district, India. Emma, Lady Hamilton by George Romney. English : Emma, Lady Hamilton by George Romney. South side of the Taj Mahal, Agra, India. 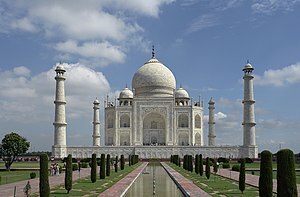 English : South side of the Taj Mahal, Agra, India. English : Juggling on the Berlin Wall on 16. November 1989. The Garden of Earthly Delights (c. 1480-1505) by Hieronymus Bosch. Oil on wood triptych, 220 cm x 389 cm, now in the Museo del Prado. High-resolution version from The Prado in Google Earth. English : The Garden of Earthly Delights (c. 1480-1505) by Hieronymus Bosch. Oil on wood triptych, 220 cm x 389 cm, now in the Museo del Prado. High-resolution version from The Prado in Google Earth. A male African Buffalo (Syncerus caffer) stays in the morning sun of Serengeti. In the background sits a Wattled Starling (Creatophora cinerea) feeding on insects disturbed by the animal and also removing ectoparasites. English : A male African Buffalo (Syncerus caffer) stays in the morning sun of Serengeti. In the background sits a Wattled Starling (Creatophora cinerea) feeding on insects disturbed by the animal and also removing ectoparasites. Part of the set of five hanging scrolls Extermination of Evil depicting benevolent deities who expel demons of plague. Shōki is a legendary Chinese deity who protected Emperor Xuanzong of Tang from evil demons. He is depicted with large eyes and a thick beard wearing a black robe, wide hat and boots. English : Part of the set of five hanging scrolls Extermination of Evil depicting benevolent deities who expel demons of plague. Shōki is a legendary Chinese deity who protected Emperor Xuanzong of Tang from evil demons. He is depicted with large eyes and a thick beard wearing a black robe, wide hat and boots. Coat of arms of Count Palatine Francis Louis of Neuburg on the church of Javorník (Jauernig), Silesia, Czech Republic. English : Coat of arms of Count Palatine Francis Louis of Neuburg on the church of Javorník (Jauernig), Silesia, Czech Republic. Autograph partiture by the Polish composer Frédéric Chopin of his Polonaise Op. 53 in A flat major for piano, 1842. English : Autograph partiture by the Polish composer Frédéric Chopin of his Polonaise Op. 53 in A flat major for piano, 1842. Admonitions Scroll, also known as the Admonitions of the Court Instructress, from the British Museum. Traditionally ascribed to Gu Kaizhi, created between the 5th to 8th century. English : Admonitions Scroll, also known as the Admonitions of the Court Instructress, from the British Museum. Traditionally ascribed to Gu Kaizhi, created between the 5th to 8th century. Tungsten rods with evaporated crystals, partially oxidized with colorful tarnish. Purity 99.98 %, as well as a high pure (99.999 % = 5N) 1 cm3 tungsten cube for comparison. English : Tungsten rods with evaporated crystals, partially oxidized with colorful tarnish. Purity 99.98 %, as well as a high pure (99.999 % = 5N) 1 cm3 tungsten cube for comparison. A Yellow-winged grasshopper (Gastrimargus musicus) caught in a barbed-wire fence. The yellow back wings are usually only visible when in flight. This image was captured in the few seconds during which the unfortunate grasshopper's head was stuck in a barbed wire fence. Australia is currently experiencing a locust plague. English : A Yellow-winged grasshopper (Gastrimargus musicus) caught in a barbed-wire fence. The yellow back wings are usually only visible when in flight. This image was captured in the few seconds during which the unfortunate grasshopper's head was stuck in a barbed wire fence. Australia is currently experiencing a locust plague. Island Spinalonga (official name: Kalidon) top view panorama, Crete, Greece. English : Island Spinalonga (official name: Kalidon) top view panorama, Crete, Greece. Caterpillar of a Peacock Butterfly (Inachis io) gnawing at a Stinging Nettle (Urtica dioica) in Oberursel, Germany. English : Caterpillar of a Peacock Butterfly (Inachis io) gnawing at a Stinging Nettle (Urtica dioica) in Oberursel, Germany. This image shows a Nikon D200 camera with a Nikon 17-55 mm / 2,8 G AF-S DX IF-ED lens and a Nikon SB-800 flash. English : This image shows a Nikon D200 camera with a Nikon 17-55 mm / 2,8 G AF-S DX IF-ED lens and a Nikon SB-800 flash. 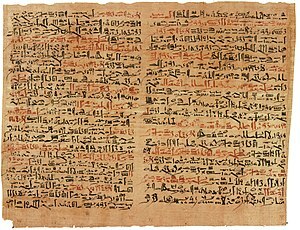 English : The Edwin Smith papyrus, the world's oldest surviving surgical document. Written in hieratic script in ancient Egypt around 1600 B.C., the text describes anatomical observations and the examination, diagnosis, treatment, and prognosis of 48 types of medical problems in exquisite detail. Plate 6 and 7 of the papyrus, pictured here, discuss facial trauma. A display of the Polish Army. Both the soldier, and the vehicle belong to the 7th Pomeranian Coastal Defence Brigade, a part of the Szczecin-based 12th Mechanized Division "Bolesław Krzywousty". October 28, 2010 marks the 872nd anniversary of the death of the division's namesake. English : A display of the Polish Army. Both the soldier, and the vehicle belong to the 7th Pomeranian Coastal Defence Brigade, a part of the Szczecin-based 12th Mechanized Division "Bolesław Krzywousty". October 28, 2010 marks the 872nd anniversary of the death of the division's namesake. Olympic Stadium of Berlin, seen from the Bell Tower (77 m high), located at the western end of the “Maifeld”. In the background you can see the skyline of the German capital. English : Olympic Stadium of Berlin, seen from the Bell Tower (77 m high), located at the western end of the “Maifeld”. In the background you can see the skyline of the German capital.